Rabbit Feed. Rabbits like this new brand of science-based, ultra-fresh, high quality rabbit food available for pet rabbits, show, and meat rabbits. Order links below. In the many years we’ve been raising rabbits, we’re not sure how many brands of different rabbit food we’ve had experience with. Most of them have been adequate, okay, run-of-the-mill, satisfactory. 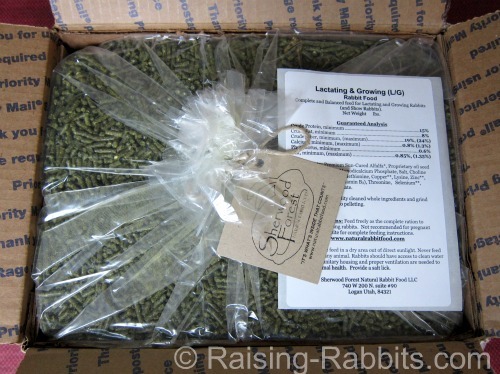 Just the other day I received some Sherwood Forest rabbit feed in the mail, delivered right to my door. When I opened the box, I could hardly believe my eyes. 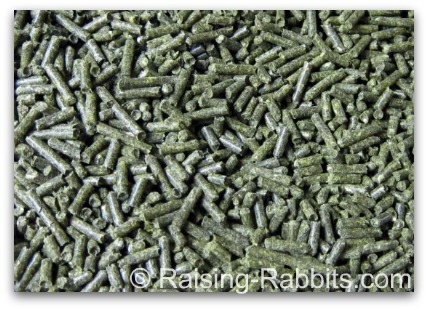 The rabbit feed pellets are amazingly dark green. I’d never seen pellets this fresh and green, ever. The dark green color is a reflection of freshness. FRESH is when the pellets are not only recently produced, but additionally the actual ingredients themselves are fresh when they go into the pellets. By FRESH, you know that the alfalfa hasn't yet forgotten the sting of the blade when the premium cut, sun-dried alfalfa is getting mixed into the rabbit feed. Those fresh green pellets on the left above are from Sherwood Forest. On the right, our regular pellets that we've been feeding. 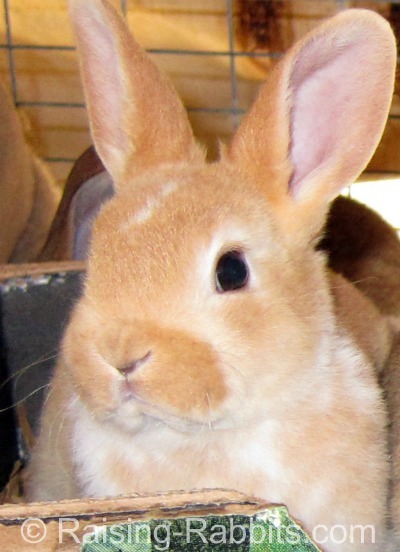 The tan pellets are a nationally recognized brand of rabbit feed. They are the best rabbit feed I can find in my area. I generally LIKE this feed. It is high in fiber, low in protein (15%), and has extra added minerals. When I’m able to obtain it within a few weeks of pelleting, my animals do very well on it, even the lactating does. The problem I have in my area is finding fresh feed. Those pellets on the right above were more than 2 months old when I purchased it "fresh" from the feed store. 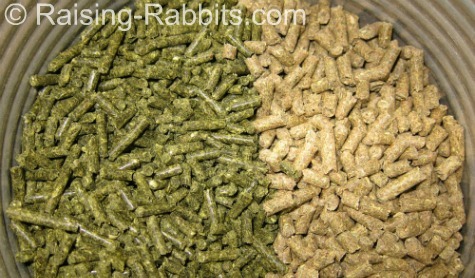 Which rabbit feed would YOU prefer to feed? After all, our other favorite nationally recognized brand of rabbit pellets is not so green. We believe the color is the evidence that all, or most, of the full complement of nutrition that was originally in the ingredients is also present in the pellet. When herbs and forages reach their peak, they are vibrantly green. They are also high in nutrients, minerals, protein and fatty acids. Which is the most important vitamin or mineral for your rabbits? The one that is missing. It doesn’t matter how perfect the feed is when it is milled - if it is old, meaning more than 45 days old, the nutrients have begun to oxidize. Oxidation destroys nutrients and vitamins. You’ve seen oxidization in action - the apple that you ate half of, and set it down on the counter to finish in 'a few minutes'...in minutes it was turning an ugly brown on the surface. 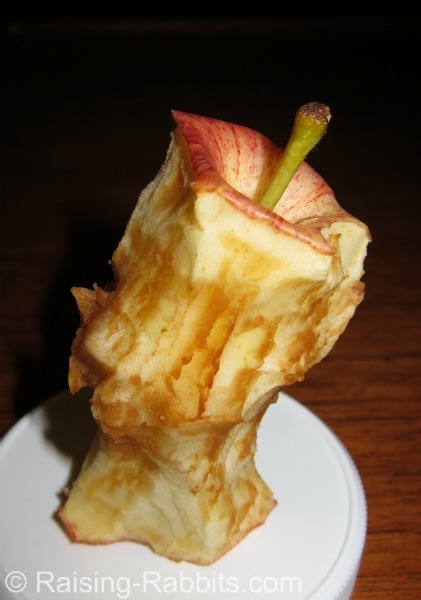 Oxidation damages the appearance, flavor and nutrients in the apple. And the longer you wait, the more brown it gets. FRESH rabbit feed represents your rabbits' best chance of obtaining ALL the nutrition they need to thrive, to effectively reproduce and to win at rabbit shows (if you show them). Sherwood Forest Feed is manufactured in small batches, so you will get FRESH feed when you order it online. What rabbit owner wouldn't be thrilled with fewer flies and no urine smells? Few flies and minimal ammonia formation is usual when the rabbits completely utilize all the protein in their feed. 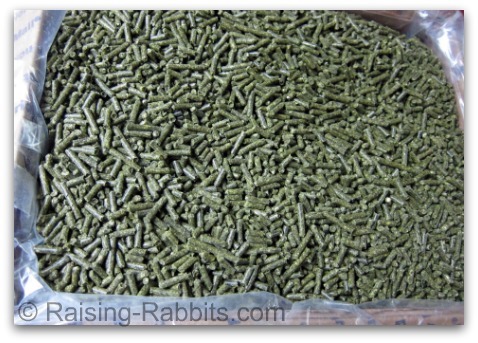 I've recently been using rabbit pellets with 18% protein for my kits and lactating does. The feed is one of those ‘just okay’ formulas, with an average, non-specific ingredient list that promises 18% protein, which is supposed to be what lactating does and their kits need. No improvement in performance over Sherwood's 15% feed (which also contains a higher fatty acid content). If I can smell it, the rabbits sure can. Ammonia production is a result of wasted protein in the feed. And then the flies feed and breed in the protein-supplying wastes under the cages. Profit margins are razor-thin for rabbit farmers. It already costs a mint to feed rabbits - why feed flies as well?? When we feed our other favorite nationally recognized brand of 15% protein feed to our lactating does and kits, believe it or not, we get better performance than we do on this 18% protein feed, and none of these side-aggravations seen with excessive protein waste. In fact, visitors to our barn usually remark about how sweet the barn smells. I used up the 18% stuff and won't go back to it. Some rabbit breeders might have a few reservations about Sherwood Forest’s formulations. If you had told me that a 15% protein was adequate for a lactating doe even one year ago, I would have been unconvinced. But the truth is, when that protein is accompanied with a specific amount of balanced fatty acids and other nutrients needed for metabolism, it IS enough. The science demonstrates it, and so do my rabbits in real life. If you’re worried about protein levels, you can lay that one to rest, at least as concerns the feed produced by Sherwood Forest. The vast majority of rabbit feeds contain just 1.9-3% crude fat. Sherwood Forest produces formulas containing 5% fat up to 8% fat. This is because the research indicates the amount of fat that is necessary for complete use of dietary protein and optimal health. With the combination of moderate protein and sufficient fats, rabbit health and condition soars, and the incidence of dangerous diarrhea plummets. Genetically modified organisms are TOXIC to both man and animal. When we talk GMO, we're not talking glow-in-the-dark frogs, but 'Round-Up Ready' GMO plants produced by Monsanto that secrete toxins from every cell. 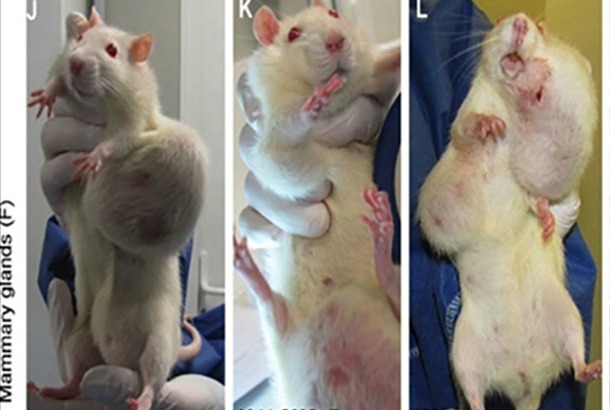 Tumors in rats fed Monsanto GMO corn drenched in RoundUp. Additionally, indisputable evidence of long-term liver and kidney harm was discovered. You can't eat a GMO product without eating toxins. How can that be good for animals??? I certainly don’t buy the "It’s safe because Monsanto said so" line of reasoning. This opinion is based on a wide review of non-biased studies -- you know, the ones where the scientists refused to falsify results and subsequently lost their jobs and were threatened with bodily harm for reports unfavorable to Monsanto, the ones where the scientists' work and reputations were smeared and discredited because they refused to budge from the truth. Dr. David Sherwood believes his products are non-GMO, although he cannot promise me that the alfalfa he sources is non-GMO.